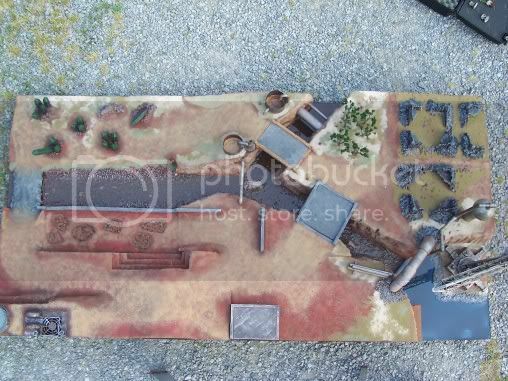 Warhammer 40k Forum Tau Online » Games Workshop/40K Related » Terrain » My Table - What Could Make It Better? Hey. I just dug out alot of old detailed scenic stuff from Lord of the Rings and some other things. I placed them strategicly to create some sort of fair board for both ends. What could I do to make it better? Change positions? Please give me your thoughts. Re: My Table - What Could Make It Better? Absolutly nothing, other then getting your terrain painted. However the larger peice with ruins on it dosn&#39;t fit in very well. I would say you have enough "specialty terrain". What&#39;s too sparse is "natural terrain". Get to work, whacking random curves and broken, craggy faces out the foam. Spray with scenic glue (or 25/75 PVA & water). Let em dry, spray em again. Primer white (don&#39;t use mini-primer... no need.) Use a small, cheap can of household paint instead. Paint your hills accordingly, then add flock, ballast (coarse sand, or dirt from your yard mixed with a bit of PVA). Arrange your twigs in a resonable tree-like pose and bind them with PVA and string until it dries. Make sure that you can fix the bottom end to a base... try one of those old AOL CD&#39;s for example, or the clear discs that come in a pack of CDR&#39;s. If you can&#39;t find the perfect fit, use a little epoxy putty to mound up a sutiably earthy lump which will hold the trunk of the tree. Then repaint the wood a bit darker. Add highlights to bring out the natural grain. Once dried, add a few spots of glue on the trunk (small!) and flock with static grass or fine flock (makes for a mossy tree trunk!). Now apply a dry of PVA to each major branch. Arrange your Elk Moss or dyed lichen onto the glued branches in a natural, hanging fashion. Wait for glue to cure up. Then spray with Scenic Glue (25/75 PVA/Water) and let dry. Average cost? Glue , flock and paint, mostly. Very cheap. Don&#39;t buy ballast... Mother Earth provides ballast in parks and beaches everywhere! Get a sandwich baggie or some Gladware sandwich boxes and load each with handfuls of sand, gravel, dirt... and so on. Boulders? Tanbark. Wash it off. Bake it dry (around 300 F is fine). primer black. Paint dark grey. Apply highlights via drybrush in DIVERGENT directions. First highlight, for example, with a medium grey moving top to bottom. Then highlight with a light grey going left to right. BOOYAH! (sorry, couldn&#39;t resist). Hope this helps. It will save money and make a ton of useable, lightweight terrain that makes a perfect accent to any game table. What? I never said anything about flocking the board... didI? During the summer, I&#39;ll make a board.... I rescently used plywood to make terrain on, a small creation. The damn board warped when I put glue on it! What wood do you recommend I use for making board? plywood is fine, but you need to batton the back side. i would use masonite instead of plywood because of a couple reasons, it cheaper and lighter. that foam is nearly 8" thick on one end. what you ought to do tho is make a modular board for storage purposes. 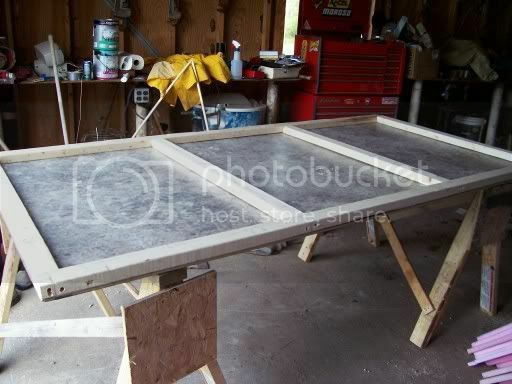 2&#39; squares for your foam boards to sit on a sheet of plywood that you can store behind the couch or somewhere. unless you have a garage or dedicated game room.